Disconnect, relax and experience all the therapeutic benefits of massage. SAVE THE DATE!! Introduce Your Friends to Serenity at our Spring Into Beauty Open House April 24th, 3:00 pm-7:00 pm !!! Deep tissue massage is designed to relieve severe tension in muscles and connective tissue or fascia, treating the deeper muscles of the body. It relieves constant pain due to heavy physical activity or injury. It is often quite intense as a result of deep specific work and generally done in a series of treatments. The primary goal of this massage is total body relaxation. To achieve this, a combination of light effleurage, gliding and kneading strokes are performed using light to medium pressure. This massage is a great choice for those with an increased sensitivity to touch or who are new to massage. Following your session, you will leave feeling relaxed with an overall sense of well-being. This massage is designed for those seeking a traditional Swedish Massage and prefer medium to firm pressure. This is a perfect choice for those seeking to alleviate muscle pain and tension, increase circulation & tissue oxygenation, stimulate the lymphatic system, and improve flexibility. Pre-Natal massage is a great way to aid your body through the stresses of pregnancy. Receiving regular massages throughout your pregnancy helps eliminate fluid retention, stress on the lower back and feet, and provides an overall sense of well-being. Custom made cushions allow you to comfortably lay on your stomach to enjoy the full benefits of a complete back massage. Traditional Thai Massage uses no oils or lotions, and rather than rubbing the muscles, the body is compressed, stretched, pulled and rocked. The recipient of the massage wears loose, comfortable clothing and lies on a mat on the floor. The receiver will be positioned in a variety of yoga-like positions during the course of the massage. There is a standard procedure and rhythm to the massage, which the therapist will adjust to fit each individual client. The Herbology Detox Body Wrap is performed for exfoliation and detoxification of the skin. It is a method of cocooning and exfoliating the whole body with a mixture of Chinese herbs that dissolve directly into the skin. In addition, the Biomat is used during your body treatment to stimulate and strengthen the detoxifying process (see description below). The body wrap exfoliates and conditions the skin, and draws out toxins leaving you looking and feeling your finest. You will instantly feel the warmth of the far infrared rays as they deeply penetrate the tissues and the negative ions begin to deliver healing signals to your body. Penetrating at the cellular level, the BioMat offers a variety of health benefits including: alleviates muscle pain, promotes healing, increases circulation & tissue oxygenation, relieves joint pain & stiffness, decreases inflammation, detoxifies, promotes restful sleep and provides immune system support. This therapy is especially effective when used in conjunction with massage. Cupping is a method in which small silicone suction cups are used to form a vacuum that helps to mobilize blood flow and eliminate muscle toxins. Cupping is a popular modality for athletes and is used for myofascial release, lymphatic drainage, chronic pain, detoxification, trigger point release, pain relief and cellulite reduction. 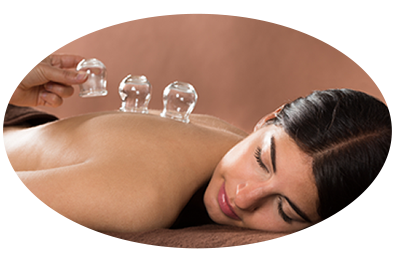 Cupping is often combined with a variety of deep tissue massage techniques but can also be added to any massage to treat a specific area.